Your mailbox has various system folders that cannot be renamed or deleted. So your e-mails are always moved to the same folders if no filter rule is set up. Unread E-mails and Favorites are not separate folders, but rather views. The Inbox folder contains e-mails you want to receive. If you mark an e-mail as No Spam, e-mails from this sender will always be put in the Inbox folder. E-mails from senders in your whitelist also always go to your inbox. If you delete an e-mail, it will be moved to the Trash folder. Be careful, though: Once you delete an e-mail from this folder, the contents will be gone forever. The Spam folder contains e-mails that were automatically identified as spam. If you mark an e-mail as Spam, e-mails from this sender will always be put in the Spam folder. E-mails from senders on your blacklist also always go to the Spam folder. The Sent folder contains all the e-mails you have sent. If necessary, you can resend messages from this folder. The Drafts folder contains your saved e-mails, which you can send or edit later on. We do not recommend saving your templates in this folder. Once you send the e-mail, it will be removed from the Drafts folder and put in the Sent folder. If you have created an e-mail to send at some point in the future, it will be temporarily stored in the Outbox folder and sent automatically later on. The Outbox folder is only shown if there are unsent e-mails. If you configured an IMAP account with an e-mail program (for example Outlook), you may have a Trash or Junk folder in your mailbox. Many e-mail programs cannot correctly link the mail.com system folders to the folders of that e-mail program because, for example, the recycling bin is called "Trash". 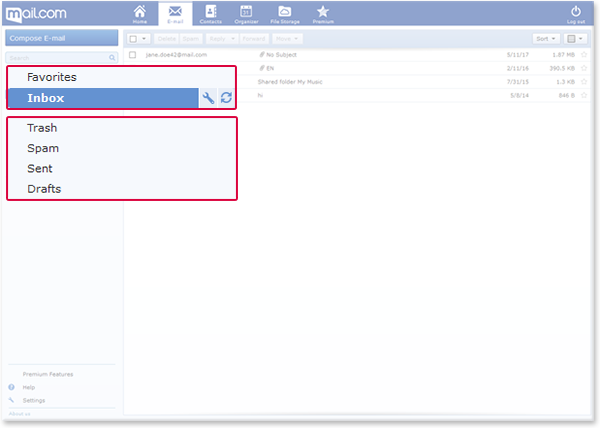 If the right folders are not found or assigned, the e-mail program will create the missing folder in your mail.com mailbox.